Are Today's Millennials The 'Screwed Generation'? U.S. student loan debt tops $1 trillion, and young people face disproportionately high unemployment. Writer Joel Kotkin points to these numbers when he claims the millennial generation is getting the short end of the stick. Kotkin speaks with host Michel Martin about what he calls the "screwed generation." Are Today's Millennials The 'Screwed Generation'? U.S. student loan debt tops $1 trillion, and young people face disproportionately high unemployment. Writer Joel Kotkin points to these numbers when he claims today's millennial generation is getting the short end of the stick. Kotkin speaks with Tell Me More host Michel Martin about his Newsweek/Daily Beast article on what he calls the "screwed generation." 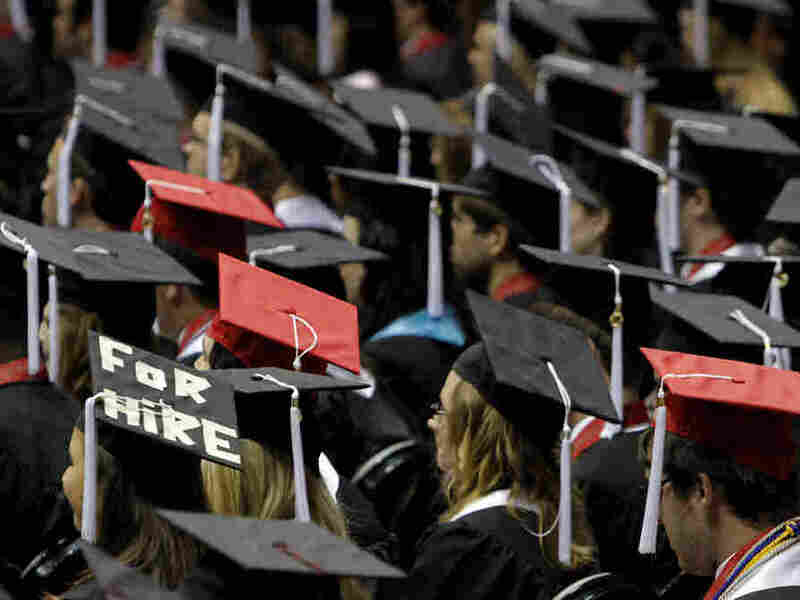 Recent college graduates "are growing up in a terrible economy that's generating very few jobs. So, they're stepping in it, if you will, economically," Kotkin tells Martin. And, he says, "they're going to inherit an enormous debt" run up by the federal, state and local governments — "that they are going to have to pay for." On top of that, Kotkin says, they face a high amount of college loan debt they can't afford because baby boomers are staying in their jobs longer, creating a tight labor market. "And, of course, the problem is that they racked up that debt, and they can't pay it because they can't get a decent job. So that's a pretty good definition of being screwed," he says. Kotkin says one of the reasons millennials are in this situation is the push for a college degree, which in earlier generations led to a better job. "In my parents' generation, the sort of World War II/Depression generation, if you got a college degree you were pretty guaranteed of a decent job because there weren't that many people with BAs," he says. "There was a huge growth in the number of jobs that needed these skills, and a relative paucity [of people to fill them]. Now the BA has become a commodity — there are so many of them. "And then, I think, there are also many young people who have been pushed into four-year schools where they would have been better off with technical training or a two-year degree, or going out and getting a job. And now they're stuck with debt."